New Delhi: A group of former civil servants, defence personnel, judges and academics Tuesday wrote to President Ram Nath Kovind, defending the controversial NaMo TV and said it is not a television channel and doesn’t require a licence. The group, however, also said that this was their view on the issue of NaMo TV and it’s “not based on facts”. “It is a value-added service requiring only clearance for the recorded contents. A letter written to the President of India on this issue, tantamounts to exerting pressure on the Election Commission of India. It is hoped that the Election Commission of India does not fall prey to such machinations of motivated groups,” the letter said. This letter was in response to an 8 April letter written by another group of former civil servants, expressing concern over the credibility and functioning of the Election Commission for failing to deal with alleged cases of model code violations, particularly those involving the BJP, and on the issue of NaMo TV. 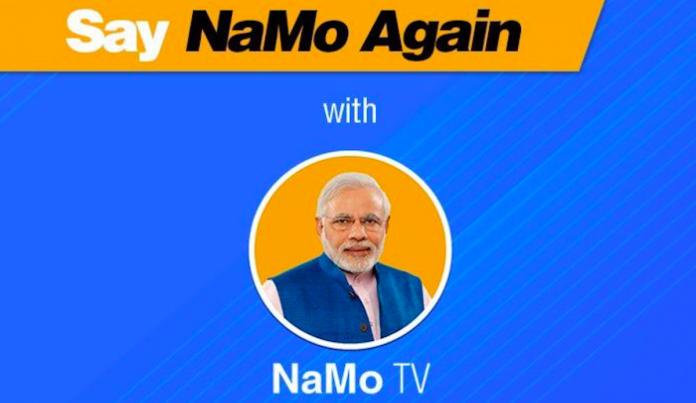 NaMo TV, a channel named after Prime Minister Narendra Modi, has been at the centre of controversy ever since it went on air. The channel had allegedly circumvented rules required to run a TV channel in India, and had been operating without a licence or security clearance from the Ministry of Home Affairs. The letter, signed by nearly 80 former civil servants, defence personnel, judges, academics, and other professionals, said “slurs” were hurled at the Election Commission and doubts being raised on its ability to hold free and fair elections. The letter expressed concerns over alleged attempts being made by certain groups to “discredit” the poll body by casting aspersions on its neutrality. Among those who signed the letter included former Delhi police commissioner R.S. Gupta, Air Marshal (retd) R.C. Bajpai, former diplomat Ashok Kumar, Lt. Gen. A.K. Sahni. “We have come to express concerns over attempts being made by certain groups to discredit the EC which has been time-tested and great credibility not just in India, but all across the world,” the letter stated. This, the letter added, gives rise to suspicion that a deliberate attempt is being made by groups with “vested interests” to denigrate such institutions of democracy by undermining their position. “This appears to be part of a larger design to influence its decision-making and to make it conform to a particular line of behaviour and thought,” the letter said. The letter also pointed out that the said group is trying to stop a 10-part web series ‘Modi-A Common Man’s Journey’, five episodes of which have already been screened before the model code of conduct came into effect. CHOKIDAR Chor hai’s 80 chamchas trying thrust namo on them who does not wish to watch. We have never seen such an election before. Truly presidential. But what if such a grandeur does not work in their favour? Biopic not banned. It has been postponed. As for as NaMo, as a subscriber like me and others, we should not forced to watch even if we have choice not to watch. We the voters should have right to unsubcribe whether it is NaMo, RaGa or any other parties channel. The retired officials should understand realising Biopic can also lead to law and order problem if pro and anti attempts to watch movie. The police forces are on election duty and cannot spend guarding theaters. It applies to Raga film as well. “…even if we’re given the choice what to watch..”: What does it say when multiple people sell the very same 🍭 everywhere you go? ‘NaMo® TV’, a service ostensibly run by [Subhash Chandra’s] dishtv)® (as I inferred from the exposé in The Wire® editions) as part of a long-existent, broader corporate “scam on public-airwaves” (which began from the early days of “UPA1”, also pioneered by the dishtv)®) — is made available at multiple LCNs (read channel #s) across channel-genres.